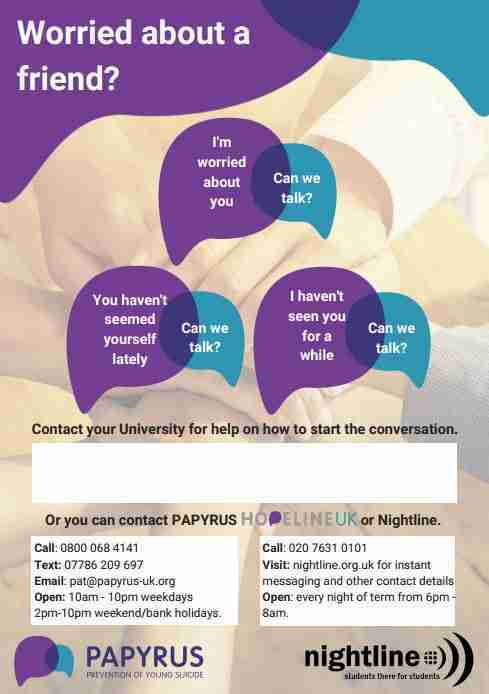 PAPYRUS Prevention of Young Suicide worked together with London Nightline to produce a set of resources aimed at students who are worried about a friend and offers some advice as well as services they can call. A3 Poster – It has the space for universities to add their in house teams to support students. This is intended for wellbeing teams, pastoral, counselling, advice services etc to put on their notice boards. 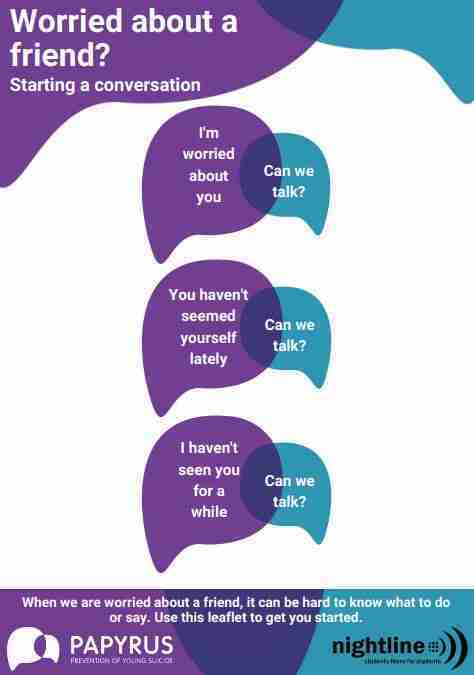 Leaflets – The front of the leaflet gives example conversation starters for students who are worried about a friend. When we are worried about a friend, it can be hard to know what to do or say. Use this leaflet to get you started. Not all universities have Nightline, so use the back of this leaflet to search whether your university has Nightline Association. “Equipping people to talk about suicide is at the heart of what we do at PAPYRUS. For young people, they are more likely to ask for help from their friends, or have their friends notice when something is not right. This collaboration with Nightline has been instrumental in helping young people to understand what they may need to do if they have a concern, and where to go if they need to talk to someone. Teaming up with Nightline to create this resource has been an extra benefit, to connect our organisations even more than they are now.” Aarti Kumari, Regional Manager, PAPYRUS. “We are delighted to be creating resources in partnership with PAPYRUS to extend our support of students! Having connected initially at the ‘Can Anyone Hear Me?’ conference on the mental health challenges faced by young people, we were excited to see how we could work together to not only increase awareness of our services but provide students with some skills to support and listen to others, skills at the core of our service. It can be difficult to know how to help those around you, and we hope that these resources can act as a prompt in aiding conversations between students at each of our 57 affiliated institutions and beyond!” Grace Handley, London Nightline. If you are experiencing thoughts of suicide or are worried about someone who might be please reach out to HOPELINEUK.